This summer, Miranda Laurion, SIS/MA '19, interned with the Hawaii Wildlife Fund in Maui. Though classes may be out for the summer, for many AU students, the season provides the opportunity for a different kind of work: heading out to experience the real world through a summer internship. In fact, a whopping 90 percent of undergraduates participate in at least one internship during their time at AU. No matter what school you’re in or what your major is, there are opportunities for everyone. 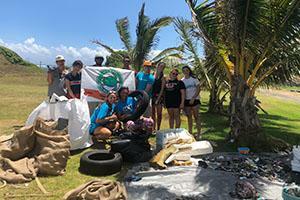 From helping to save endangered turtles in Hawaii, to working on a death penalty case in rural California, five students share their experiences and highlights from summer 2018 internships. Learn more about the path to an unforgettable internship experience, from the application process to earning academic credit or monetary compensation, through AU’s Career Center. University Communications (UCM): Tell us about your internship. Kotler: I’m a physics major, and I’m also an international student from Israel. It was a bit hard to find something that was open for non-US citizens, but then I came across an internship at the Space Telescope Science Institute in Baltimore. I did some work with gravitational waves with Dr. Harry at AU, and I thought it would be a great way to explore more astronomy and astrophysics. The project I was working on was supernova classification using machine learning algorithms, so it was a lot of coding using Python. The main goal was to classify different supernovae and then create a diagram to find the rate of the acceleration. UCM: What was a highlight of your experience? Kotler: The opportunity to present the research at the end of summer. A Nobel prize winner, Adam Riess, who is a professor at Johns Hopkins, came to my presentation. That was insane, to present research in front of someone who won such a prestigious prize in physics. Also, seeing what you can do with a physics degree. I didn’t know that you can do so much with astronomy and astrophysics. I didn’t know that there was so much to investigate and so many things that we still don’t know. That was the most incredible part, to see what the real world is like after you graduate. UCM: How will this internship help you in the future? Kotler: It was a great opportunity to see what full-time research is really like. Over the summer, I had the opportunity to work only on my project. Here at AU, I have my classes and other things to do, so I can’t work in a lab all day. Also, presenting my research—I hadn’t really had a lot of opportunity to talk in front of an audience and present something. My presentation was 20 minutes or so, and I was terrified, but it went well. I feel like I developed skills that would help me in the future, like critical thinking, because most of the work is independent work. You take the data, you analyze the data, you try to come up with the code that will classify your data. Of course, I got stuck a lot of time, and my adviser was there to help me. But most of the work was just with the data and the computer. I learned how to deal with data I’d never seen before and developed a lot of skills that will help me in grad school when I work on my thesis. UCM: Tell us about your internship. Mohammad: I was working on the digital section of the NBC4 website. I was doing a lot of writing, a lot of posting broadcast segments onto the website. I also had some of my articles turned into TV packages, and a lot of my articles were nationalized. I did interviews and scoured social media for photos we could put on our website of certain events, like an immigration rally and the "unite the right" rally. I gained a lot of really powerful insight about working in the newsroom. Mohammad: Being fortunate enough to be in the newsroom as a lot of really important things happened this summer. Like the Caps won the Stanley Cup, so that was really pivotal. I was tasked with making a gallery and writing an article about it. I was also at Capital Pride, shooting photos to use in a gallery. Being in the newsroom gave me a much wider access to a lot of really cool things happening in the area. Because I’m from the DMV area, a lot of it was a childhood dream come true. My first story was about this obituary of a retired colonel who was being laid to rest in Arlington, and it went pretty viral on the DC subreddits. It was like, “a resident of northern Virginia for the last 30 years, he hated how all of you were incompetent at driving properly.” A lot of people found that really funny. I quickly wrote an article, I talked to his wife. The next day it got packaged for TV, so they talked to the wife more. And then it also did super well on our Facebook page, which was really cool. Mohammad: I think my time at NBC4 made me a better reporter and helped me to know what works in the digital landscape. Just having that real-world experience pushed me ahead in being a better reporter for class or even for future internships. Having the skills of knowing what is or isn’t newsworthy and what to report will definitely help me a long way. Quezada: It was an internship with my county’s public defender, and I basically did paralegal work. I’m from rural California, and I knew I was going home for the summer. I’m the first one in my family to go to college, and to just leave across the country and not come back would be a mistake I think. I really just wanted to get a feel for what it was like to be in criminal defense, because I am interested in law school and almost certain I want to go. It was a really good internship to see what the court environment and the law environment is like. Quezada: I liked all of it really, but the highlight would be being the intern that worked with the two lead attorneys for a death penalty case in superior court. I also did a lot of stuff related to homicide cases, like redactions and trial binders. Quezada: They really want me to come back next summer as well, and they said they would be able to write a letter of recommendation. That goes a long way. Career-wise, I don’t know if I want to go into defense just yet, because I’m also looking at intelligence or investigation. Litigation would be great, too. As far as gauging what I like, I definitely like it. Is it exactly what I want to do? I’m not sure yet. But it will help a lot with my career. AU has a program [the Eagle Internship Fund] that can pay students a stipend when they take an unpaid internship. I couldn’t have done it without that. Laurion: I was an intern for the Hawaii Wildlife Fund, a nonprofit working with marine conservation—specifically sea turtles. I participated in three different projects. One was the Honu Watch, which was educating locals and tourists about the green sea turtles that bask on the beach, making sure that people stay 15 feet away from them. We take data on their numbers and health, and if they’re tangled and have debris on them. The second was the Hawksbill Sea Turtle Recovery Project, another species of sea turtle they have in Hawaii that’s critically endangered. That was more monitoring beaches and nets and monitoring turtle tracks to see if a turtle has laid a nest. We’d cover the nest, protect it, and block it off, and watch out for hatchlings. That was the coolest thing I did because it was more about scientific interactions. I would actually help assist a representative from NOAA that came from Oahu and the director of the Hawksbill Recovery Project. We’d tag the turtle with a satellite tag so we could track what they’re doing and try to get more info on a turtle’s lifespan and where they go. The third project was hosting youth groups, students who come over from mainland states. We’d educate them on reef ecology and the turtles. We’d do a beach cleanup and teach them how to alleviate trash. Laurion: The biggest highlight was definitely working with the endangered species. It’s such a rare and special thing that I got to be a part of. I was able to watch state biologists, the representative from NOAA, and the people of my organization and learn a lot about these turtles and be able to assist with tagging, taking data, excavating a nest, relocating a nest that was going to get washed out. Being able to hold an endangered species turtle egg—that kind of hands on work was really valuable to me. Through my studies I’ve read a lot about scientific research like this, so being a part of it was a highlight. Laurion: I was already interested in water issues, both freshwater and coastal resource management. It helps to have some real, hands-on experience that I can apply. I’ll be able to focus my work more on my interests. Also, for future endeavors, I’ve made a great network in Maui and they’ve been really supportive, offering assistance, putting me in contact with people for future opportunities or writing letters of recommendation, or even just welcoming me back after graduation. I can definitely learn a lot more from them, especially if I took on a role beyond intern and expanded my responsibilities from what I did over the summer. I could definitely see myself going back. Lynch: I worked on the US MS TYSABRI [a treatment for multiple sclerosis patients] team in product marketing. I looked across MS competitors and indirect competitors to conduct a social media audit and give recommendations and insights on ways that we could best utilize social media within the MS space. I also had a chance to participate in market research for a campaign that was coming out, I participated in meetings for annual brand planning and overall organizational meetings, I got to go to US commercial meetings to find out how things were going within the overall US operations, and I did weekly lunch and learns with different stakeholders within the organization to learn more about how Biogen functions. Lynch: I would definitely say the travel component. It wasn’t something I was anticipating, coming in as an intern, but I had a chance to travel and learn what was going on in the MS franchise, and I had the opportunity to see firsthand market research for specific campaigns. I thought that was valuable. It was a chance to take things that you learn in the classroom and apply them to real life scenarios. I also have a keen interest in social media, and going into my internship it was my goal to learn about how you can utilize social media within biotech and pharma in a way that’s compliant with FDA guidelines. So I had a chance to learn a lot about how marketing and social media work in the biotech industry this summer. Lynch: My internship served as a stepping stone into entering the pharmaceutical industry and biotech space. This semester, a lot of the things that I’m learning in market research are things that I actually had a chance to participate in over the summer. Getting to sit in a focus group, or in-depth interviews, or sit behind a one-way mirror and record the responses of participants. That was really valuable to me. My goal coming out of school is I would love to be a product manager, so I think that this served as a great first step into a product manager role.